We’d love your help. Let us know what’s wrong with this preview of Patsy Walker, A.K.A. Hellcat!, Volume 3 by Kate Leth. To ask other readers questions about Patsy Walker, A.K.A. Hellcat!, Volume 3, please sign up. The book kind of goes off the rails here so it's probably a good thing the series came to an end. For some reason, the cutesiness of the book really grated on me this time. Maybe because there's not much story here? It just feels like filler until the end of the book. It's Patsy...for the final time. 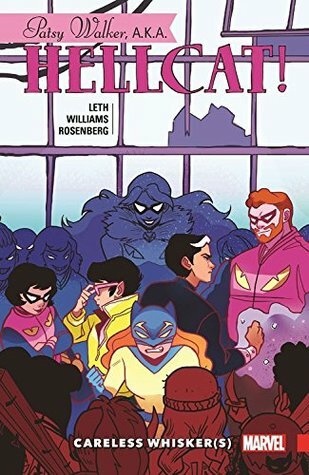 With one last volume, Kate Leth and Britney Williams' Hellcat says goodbye - but not before putting Patsy through literal hell as all of her evil exes turn up for revenge, thanks to an ill-advised Hedy Wolfe plot. I'm very sad to see this series go, but it gets a very good send-off in these final issues as Patsy and her friends come to the ends of their respective character arcs. The absence of She-Hulk is noticeable, but Jubilee fills in quite nicely and offers some good visual jokes thanks to her vampire-ness. I'm really disappointed this series ended so quickly, because it was a great experience to read for multiple reasons, one of them being how LGBT characters were featured as being accepted and cared about throughout the stories. The last few issues were cheerful but also had meaning to them, and I'm glad that the writers were given enough time to be sure this volume ended on a high note. It's a shame the comic wasn't able to continue, but at least since it's short I can probably convince more of I'm really disappointed this series ended so quickly, because it was a great experience to read for multiple reasons, one of them being how LGBT characters were featured as being accepted and cared about throughout the stories. Such a shame that this book ended (although I know I'm partly to blame, being a trade-waiter and all). Kate deserves so much credit for making this mostly-neglected character into such a cute, great person with a full world. Especially the stuff around Jen in this volume got me all 😭. Also it's just so funny and cute. Vamp Jubes get to mall rat around! So many hijinks! This was such a great series to read. It was funny but also dealing with real life issues. Patsy is so interesting. I love that she gets stressed because she takes on too much. I love that sometimes she had problems opening up and sharing. But she is also so caring. She's such a great character who feels so real. I'm going to miss Patsy and the gang but I'm so happy to have read this series. So very sad that this is the last Pasty Walker, AKA Hellcat volume! This series was so cute and fun, even though it had its serious moments, Patsy and her friends are so delightful, diverse without being heavy-handed, and so supportive of each other. The wacky hijinks are intermingled with their personal stuff and superhero backstory is referenced gracefully. I'll miss this series going forward, but what we got was full of great moments and adorable artwork. Highly recommended. More rollicking good times with Patsy and pals! Another slam dunk of silly, cute humor that is just purrfect for this character. Absolutely delightful. I will miss this comic so much! Patsy is delightfully hilarious and the art is amazingly adorable. Friendship and talking through your problems and beautiful queer people everywhere. Everything good. Love. it's almost as if this volume was written specifically for me. It references Wham! and Interview with the Vampire. It just needed some Howie Mandel. Marvel, please stop canceling great titles. Thanks! Absolutely CRUSHED this is the last volume. What a gem of a series. Volume three is titled Careless Whiskers, since Patsy makes herself sick which causes some alterations to reality. It's also (seemingly) the last volume of the series. I really loved this book. Black Cat's arc was resolved but still left open ended. It was interesting to see two former friends now acting as enemies. For such a light read, this comic has some deep layers. By far, Jubilee is my favorite character. She is just the freaking best. I don't really know much about her but I'm glad she m Volume three is titled Careless Whiskers, since Patsy makes herself sick which causes some alterations to reality. It's also (seemingly) the last volume of the series. I really loved this book. Black Cat's arc was resolved but still left open ended. It was interesting to see two former friends now acting as enemies. For such a light read, this comic has some deep layers. By far, Jubilee is my favorite character. She is just the freaking best. I don't really know much about her but I'm glad she made an appearance here. Hellcat never manages to hit the heights of it v1, but this is nonetheless better than the poorly-organized and anticlimactic v2. Oh, it starts off with the other half of the Black Cat story from v2, that was inexplicably cut off right in the middle, and that Black Cat story continues to be over-stretched and dull. But, there are nice character bits, and we get more nice character bits in the two-parter flu story and the one-parter shopping story that conclude the comic (and which are better tha Hellcat never manages to hit the heights of it v1, but this is nonetheless better than the poorly-organized and anticlimactic v2. Oh, it starts off with the other half of the Black Cat story from v2, that was inexplicably cut off right in the middle, and that Black Cat story continues to be over-stretched and dull. I'm sad this series ended here--I had no idea it was cancelled when I was reading it and I hoped that the fourth volume would blow me away a bit more. The first volume was so promising, but the end of the series didn't really close the deal for me. Fun and enjoyable, I liked it. Didn't have enough time to really build a beautiful arc or have the kinds of character explorations that turn like into love. I really did love this last graphic novel, but I felt that there were some things unfinished especially with Jen & Patsy. You can't end the series without finding out what happens with Jen. U was hoping we would get some kind of closure with that, but we didn't. Overall though, it was a great series and I was sad to read that was the end of the Patsy Walker series. I really did love the characters in it & makes me want to see Patsy and the gang again. I hope someday. The continuation of the kind of boring out of place Black Cat story line which was meh. And a new story arc where Patsy has a reality shifting flu caused by stress which was quite good if silly. I rolled my eyes at Belial and Patsy's arch nems turnaround and relationship but then got on board. Mr. Sniffles was adorable. And a single issue about a trip to the mall that was cute but also just kind of okay. Total bummer that this heart-warming and charming series was cancelled. Was looking forward to like, a super badass and cuddly crossover with Unbeatable Squirrel Girl or something similarly perfect for these great characters. I loved the strong, affectionate friendships, learning more about She-Hulk (note to self: go read She-Hulk), and watching Patsy grow her agency and confidence. I can't believe the series is over already! I'm so sad to see it go, but at least it had a strong send off. I loved this series so much, it's lighthearted and at times silly which is great for younger readers and kids at heart. I would recommend this for fans of The Unbeatable Squirrel Girl because the humor is similar, so many puns! Al igual que los volúmenes anteriores, muy divertido y entretenido, las tramas no son impactantes, rebuscadas o para recordar, pero lo pasas muy bien leyéndolo. Además los personajes son todos geniales y hay mucha representación, cosa que en la mayoría de cómics escasea, por desgracia. Lo mejor sin duda ha sido Patsy, es un personaje que realmente inspira, y me ha encantado acompañarla en este viaje de auto-descubrimiento y superación personal. Aunque no sea un cómic que considere esencial, voy a Al igual que los volúmenes anteriores, muy divertido y entretenido, las tramas no son impactantes, rebuscadas o para recordar, pero lo pasas muy bien leyéndolo. Además los personajes son todos geniales y hay mucha representación, cosa que en la mayoría de cómics escasea, por desgracia. Lo mejor sin duda ha sido Patsy, es un personaje que realmente inspira, y me ha encantado acompañarla en este viaje de auto-descubrimiento y superación personal. I see what they are doing here. But it's hard for me to jump between, often on the same page, cartoony and realistic art. And I see how they want to do a romance funny book, but the content is really not all ages to me. I think it would have been better to just create a new character to try this experiment with. Kate Leth (born 1989) is a comic artist and illustrator who has been posting her comics online since late 2010. She is mostly known as a webcomic artist, although she has been published in a few anthologies and occasionally sells prints of her mini-comics. She works at the comic shop "Strange Adventures" in Halifax, Canada. She also writes for Bravest Warriors, Fraggle Rock and Edward Scissorhands Kate Leth (born 1989) is a comic artist and illustrator who has been posting her comics online since late 2010. She is mostly known as a webcomic artist, although she has been published in a few anthologies and occasionally sells prints of her mini-comics. She works at the comic shop "Strange Adventures" in Halifax, Canada. She also writes for Bravest Warriors, Fraggle Rock and Edward Scissorhands.